Princeton Village was just completed February 2009, Happy Birthday Princeton, I was moved by the charm of the view and of course how the light lit up the houses. 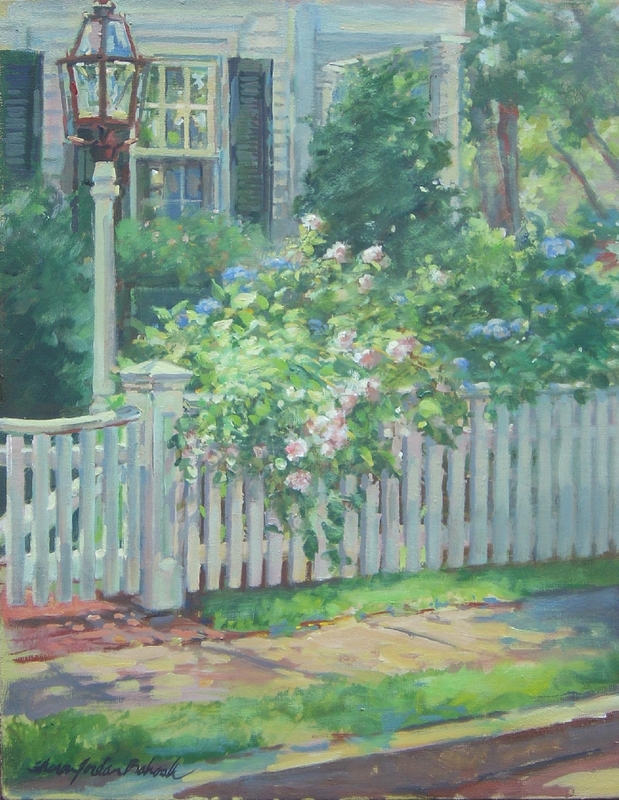 Look beyond to the range of colors which completes a beautiful New England vignette. 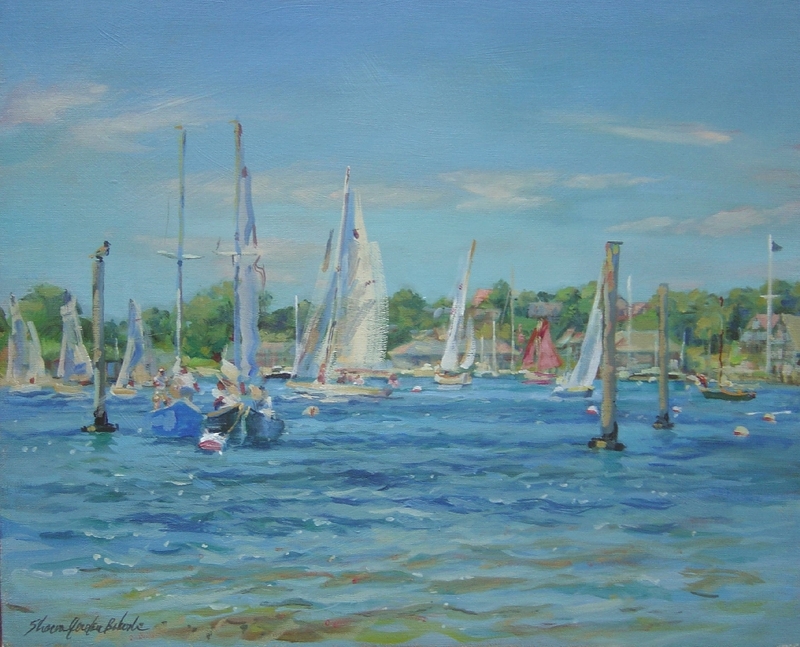 Regatta Morning Ah one of my favorite paintings last season, I can still feel the feeling of the crisp ocean air even though it's August we're cool and comfortable, I'm on the Island's sand bar which houses the Edgartown Lighthouse, Half way through a family of ducks come and nibble at my toes, wish I had some bread for them. I rarely bring any food or drink with me when I paint, I'm all business. Oh what a day, two days in a row. First day I put in all the background and second all the boats. Exciting they were all active. Sirius, the Tug I am so fortunate to capture a moment in time. 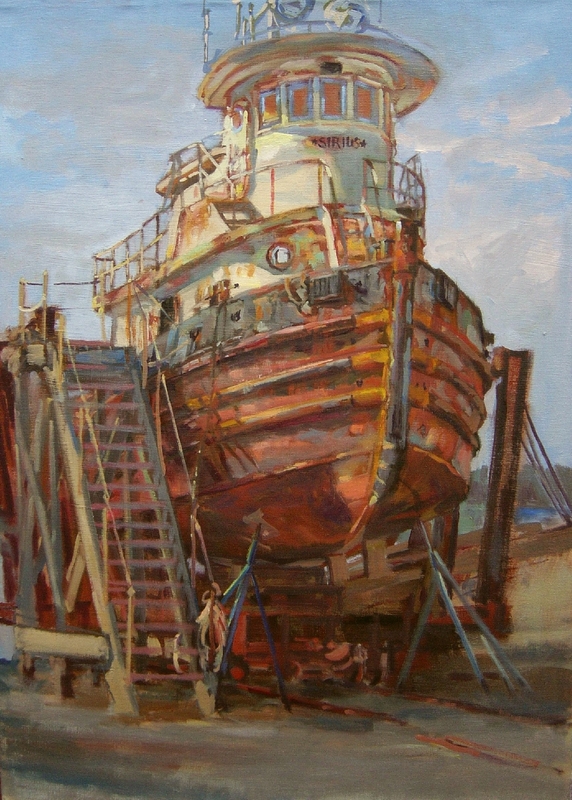 This tug was in for repairs in Vineyard Haven harbor in August 2008 and I love to paint boats, usually they are more of a challenge because they bobble in the water or they move on the next day, this one was in long enough for me to really get a feel of the old rust bucket, I love it! Bright Spot in the Shade Inspired by the light that popped and the flowers staged in an otherwise cool green place. It was done on Martha's Vineyard where I lived 7 summers and into the fall when the season allows for a longer painting season. Sharon Jordan Bahosh is a professional artist, since 1973 she has made art her business and livelihood. 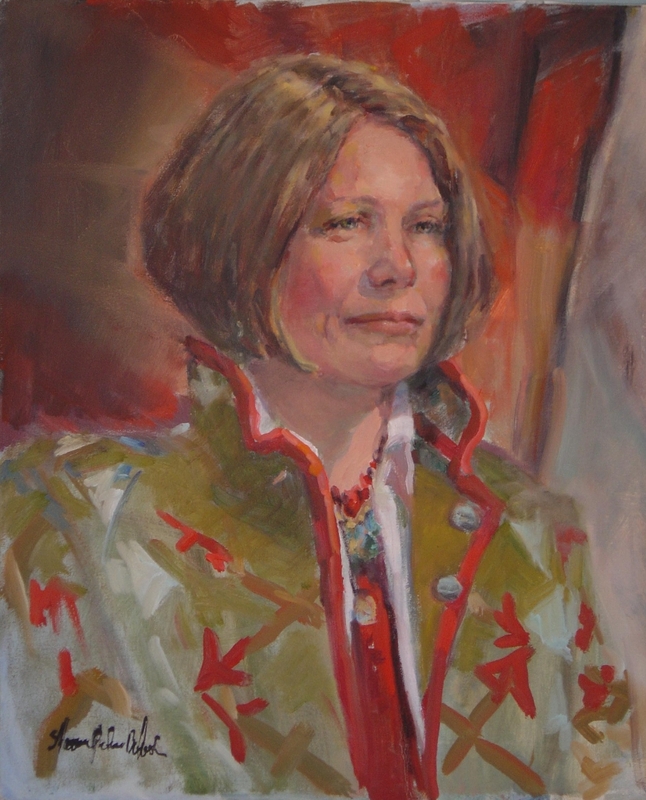 She has been a member of the portrait group in Princeton since the mid 1990's and enjoys keeping her work sharp by participating in the workshops each week especially in the winter. Otherwise she is in the open air recreating moments in time. "An artist is a historian" she says, "capturing sights that sometimes dissapear." 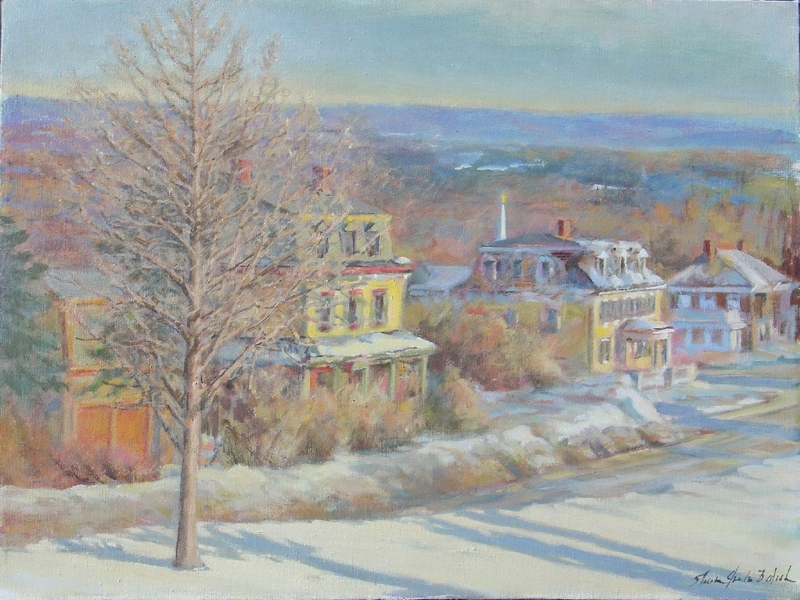 Her painting of "The Shacks" in Gloucester was featured last year at the Northshore Art Association annual fund raiser. The shacks no longer exist they were taken down before they would fall into the harbor. Sharon is a member of the Northshore Art Association, Academic Artist Association where she has earned awards and has membership status at the Rockport Art Association, Oil Painters of America and the Portrait Society of America. She recently returned from living on the Vineyard where the painting season reached well into the fall. She has set up house and a home gallery in Gardner. If you look at the pictures you will see some Vineyard influence as well as Cape Ann distinction. Look for her and her easle when the weather warms up. Many scenes from here have been beckoning the artist. She is currently represented by Willoughby Fine Art Gallery in Edgartown, Martha's Vineyard, Aries East on Cape Cod, and Celebrations Gallery & Gifts, Pomfret CT. 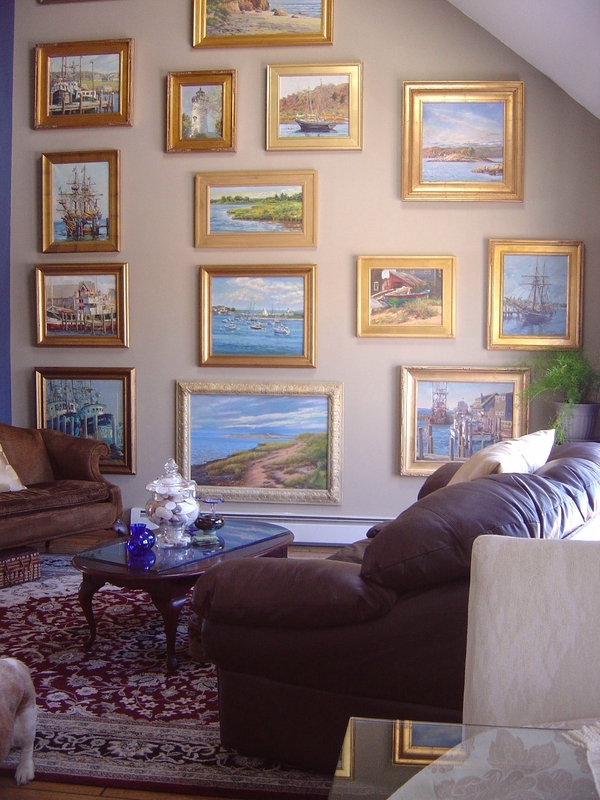 Living with Art I moved from Martha's Vineyard in Sept. 2008 in order to establish a new gallery, a home gallery. After having a studio separate from my home for many many years I am finding living with my art allows me to see where I've been and where I'm going, literally since my paintings are done in the open air. Another plus is in a time of rising fuel prices combining the spaces makes good sense.